It isn't a secret that most people like a good pampering especially for the feet as they take a lot of battering each day. 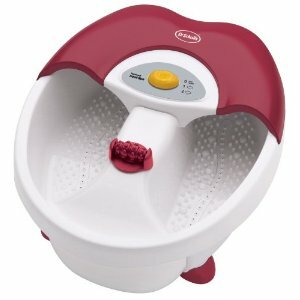 Dr Scholl's Toe Touch foot spa is designed to revitalize and relax tired feet with its soothing massage function. It also has a smart heat feature that helps to maintain the waters temperature and 3 stationary massage attachments to provide a reflexology massage. The foot spa itself is white with a currant colors hood to act as a splash guard. The bottom of the basin is accunode textured to relieve tension in the soles of the feet and also act as an non slip surface. Most patron think it is great value for money at $26.99, although a few think it is very noisy. There are a couple of patrons that thought the compartment where you place your feet is a little small and only suitable for people with small feet. The majority of users like how the water stays warm and how lightweight the foot bath is. This makes it easier when emptying the water. You are currently browsing the archives for the Foot Spa’s category.